The Better Earthing Pad is made in Australia and sewn from two layers of tough fabric with natural antimicrobial mineral fibre inside that actively kills bacteria and odours. 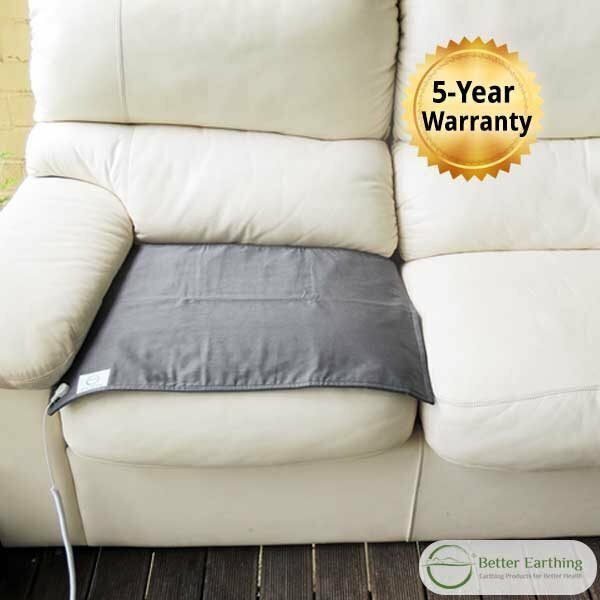 It comes with a 5-year warranty on its effective earthing life. Health benefits may include increased energy, reduced pain, better blood circulation and protection from EMFs. 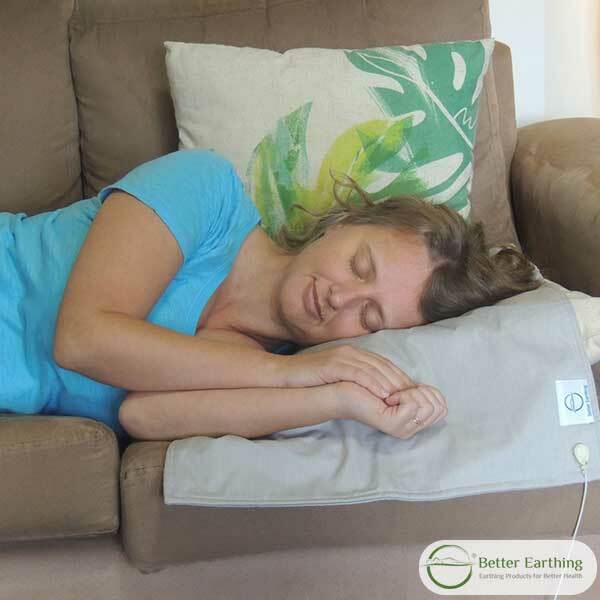 Use your earthing pad while resting, working or travelling (see more below). They make a fantastic mat for pets too. This pad is conductive on both sides and is made with fabric containing surgical grade stainless steel fibre (30-35%). See full fabric details below under additional information. The size is a generous 48 x 60 cm that is ample for a chair seat (including one seat on a sofa). It can be folded to suit smaller areas including on your desk in front of a keyboard to rest your forearms on. 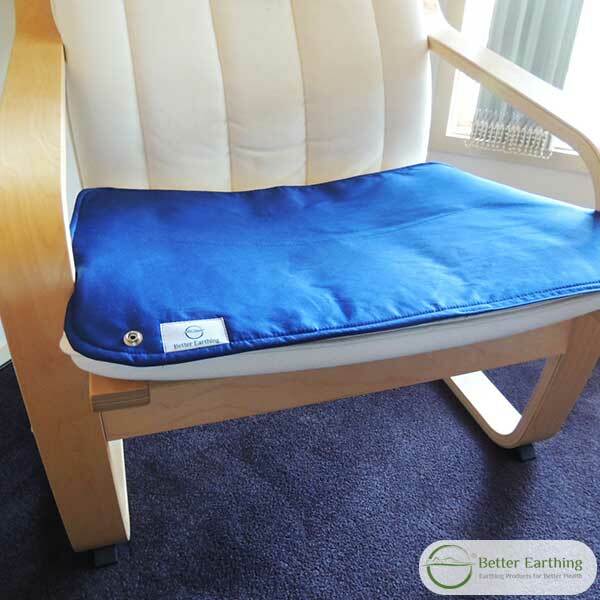 It can also be used as a floor pad to rest your feet on or a mini earthing sleep pad overnight. 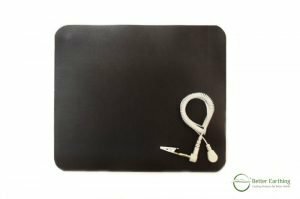 Comparison to other products: The Earthing Pad is more conductive than any Earthing Mat but is not as full an earthing experience as sleeping on our large mattress-sized earthing undersheet. 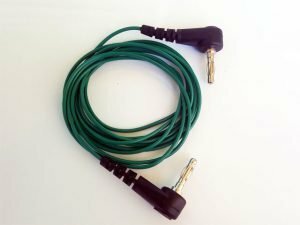 Comes with a straight lead (if you would prefer a coiled lead please leave a note in the checkout), an AU/NZ green earthing adapter, and product guide. Sit on it at home or at the office. It works through clothing. On top of a desk to rest your forearms on. On the floor and rest your feet on it. Put it on top of your yoga mat while doing seated asanas. Use it as a mini-earthing sleep pad in bed. Pets love earthing and benefit too so give your cat or dog their own pad as a pet bed. This fabric is robust like denim or soft canvas. 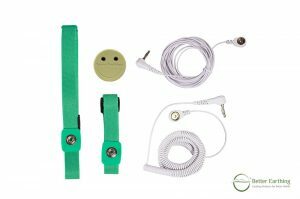 Earthing Fabric Made from surgical grade 316L solid stainless steel fibres (30%), cotton (35%) and polyester (35%) for toughness and durability. Felt Composition (1mm thick): German-made natural mineral fibre that is antimicrobial and antibacterial (12%), Tencel (68%), Polyester (20%). Can be machine washed on gentle and soaked in any clothes detergent. Stainless steel fibre is NOT affected by general clothes washing detergents should they contain some bleach or whiteners. Can be ironed on low / synthetic heat setting with steam. 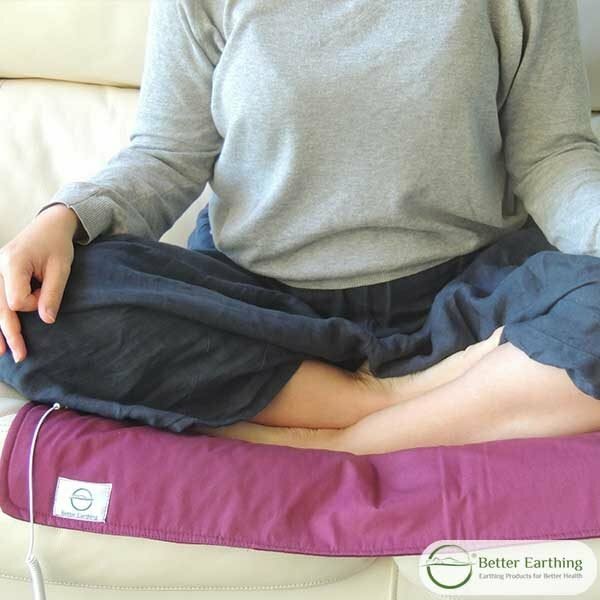 I am loving my earthing pad – I sit and sleep on it all the time – I even take it to work and earth my clients on it for a wonderful more relaxed therapy session. I sleep very well on it and experience excellent deep restful sleep even though only part of my body is on the mat. As a result pain in my upper back and shoulders has gone away, and my blood pressure has lowered significantly and I have halved the medication. So I am thrilled and I will be investing in an earthing pad for my treatment table plus an earthing sheet for my bed in due course. My 76th Birthday is next month and I will give myself these amazing high quality products as a present. I purchased the grounding mats and sheets for my wife and she is extremely happy with the outcome thus far. She is very sensitive to emf and electrical radiation from PowerPoints. Earthing is part of our strategy to help remove excess charge from her body. In the two weeks that she has used the grounding mat and more recently the bed sheet and pillow case she has noticed improvement. 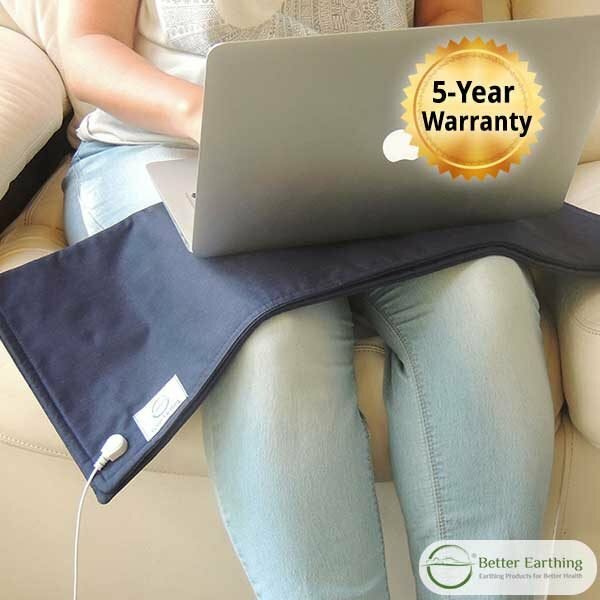 I have been using my earthing mat for about one week and although I am on a low dose of meds for my arthritis I have had no pain in the morning when I get up which is the past I have had breakthrough pain of the morning after doing exercise the night before. 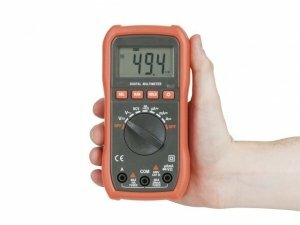 This is the best value for money of all the earthing items I own. If I travel, I take it with me for sleep. I use a fitted earthing sheet and pillowcase, a car seat mat, a standard earthing mat in the kitchen, and this mat on my chair. I am usually earthed for about 13-16 hours/ day, and it really helps my chronic fatigue and pain. From the first day I tried earthing, I have been able to improve my “stress score” on my fitness tracker dramatically. When I sit or sleep grounded I feel calm, heavy and deeply relaxed. 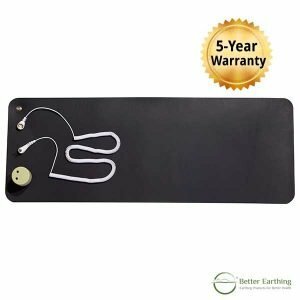 I recommend this mat to anyone who wants to try earthing for the first time. 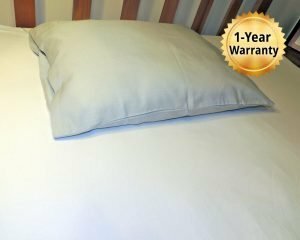 It is comfortable enough to sleep on, durable, very effective, and small enough to take travelling. I do not go anywhere without it. I’m loving my earthing pad, thank you. After years of despairing of my efforts having little effect on my pain and mobility issues earthing seems to be working a real treat for me. I am having a better quality sleep, waking up less and less during the night. I have greater ease of movement and less pain. These just keep getting better and better. The colour in my life is becoming more vibrant. Incredible products. Bought the earthing pad, pillowcase, and universal undersheet and they were all delivered very quickly. Customer service was amazing, and I called a number of times trying to work out what products would be best for me. All products were beautifully wrapped and look like they are good quality. So far I have used only the earthing pad and today is the first time in months that I haven’t had an anxiety attack at work or felt out of control and binged on unhealthy food. I feel calm and peaceful, yet clear-headed. Its crazy how much difference I feel. I have an office job and work in Sydney, so hardly get a chance to step out of the office and away from the computer. I can’t wait to try the other products! Cannot recommend this company enough! The Earthing seat pads are a huge hit not just for myself but also for my indoor cats. I find I am having to share both the Earthing pads and sheets with them and have realised that they too seem more content an relaxed as a result. So again it seems our nervous systems and aches and pains are benefiting from Earthing. At night when I got home and laid on it on the lounge I was so relaxed that I nearly fell asleep without eating dinner. In bed I slept a half night on it; it was the first time in over 12 months that I had no trouble getting to sleep straight away. The next night I did a full sleep on it with the same effect. I can’t believe that I got to sleep so easily!!! I also didn’t keep waking up during the night. AND using it in front of my computer really seems to stop that dregged out tired feeling. To have those two issues addressed is a really big thing for me – I am very happy with it. I haven’t had any adjustment issues except for a bit of heat generated the first night, and occasional stinging spots that are hardly noticable – kinda like a midge is biting you. I have also noticed that when I get up in the mornings my breathing is a bit easier, so on some days I use less asthma medication. 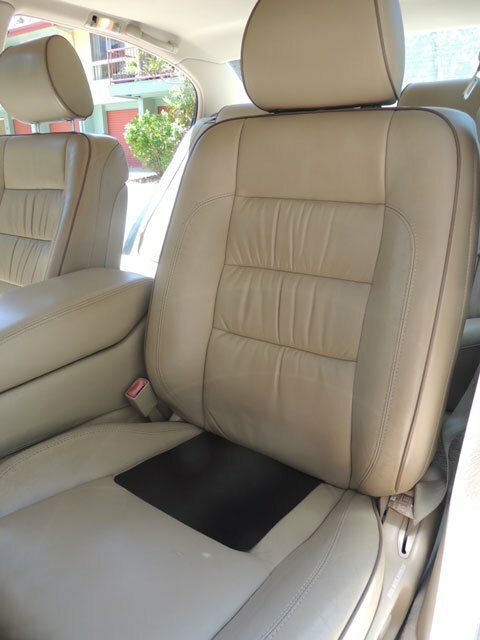 I put this review on the page for the wrap but thought that since I am using the seat mat with the wrap and a foot mat, I would place it here as well. My husband is a large-ish man. The large knee wrap is ‘just’ long enough to wrap around his large, swollen knee. The mat at his feet is ‘just’ big enough but if there was a wider one, I would have bought it because his feet shift around a lot on the ground under his desk. The seat mat is brilliant – tough – like a light, durable canvas fabric. It’s a perfect size although he has mentioned that sitting on it makes him perspire so maybe putting a cotton tea towel over it would help, in future. I purchased 2 of these mats as gifts before Christmas. Customer services was outstanding and the mats came so quickly. My parents and sister both noticed they slept very deeply the first night they used them and were very surprised with the results. Thank you! About 6 months ago I gave an earthing pad to my daughter for her birthday. I recently asked her if she had any benefits from using it. Her reply was ‘Not sure but I no longer get any headaches”. She had suffered bad headaches most of her life. I have an earthing underlay sheet & love it. I bought this for my parents to sleep on as they are getting old and they complain of aches and pains. My mum in particular will wake up every morning with leg cramps in the middle of the night. Since using the earthing sheet, she said that she doesn’t get leg cramps anymore which is amazing. I think this is a good product because there is science behind the way it works and the product is made well. I’m still working my way into the amount of time I use the pad. Gradually working up to more time but I find it easy to overuse it and get a toxic effect. At the moment I sleep half the night with a larger pad and sit on the small pad during the day/evening for a few hours. Drinking heaps of water and walking helps move the toxins. I can see that it will take quite some time to clear away this after so many years of built up stress, etc..
After that long story – I can report a great improvement with sleep, feeling a lot more relaxed and calmer. My asthma still causes a problem but has changed somehow which I feel means it’s working on it. My general wellbeing has improved a lot too. This pad is completely indispensable to me. I washed it yesterday – a carefully planned operation so I could be sure it’d be dry before bed! My ability to sleep started improving the first night and my hot flushes are much reduced. I have overdone it a bit, leading to aching, sore legs, so for now I’m putting the mat under my lower legs and feet only in bed. That’s the 16-day-in report. ‘It’s been great having the Earthing Pads we purchased. Both my wife and I have been using them throughout the day at home as well as sleeping on them. 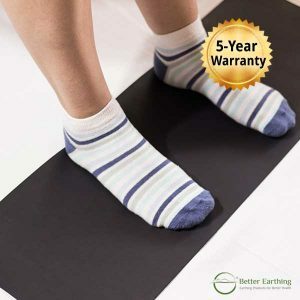 I have a cellulitis that arrived on my foot since going bare foot in many places and I believe that the Earthing Mat is helping. Earthing is a great discovery ?? 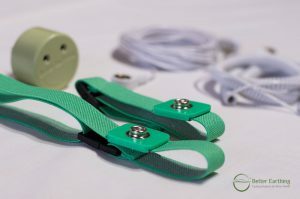 I am using earthing pad at night, during the day, and when I am treating my patients. I even share the pad with my patients too when they are having acupuncture. I used to be exhausted after treating patients. Now I have energy. When I do root acupuncture treatment, I feel the gathering of Chi so much more. The needle feels heavier and there is a different quality of sensation. I cannot describe it. It is amazing. It’s like I am gathering more Chi and passing it to my patients. Well I am sleeping on the EARTHING Pad after many many years of suffering from a sleep problem, put that down to the alteration in the nervous system, my shoulder is progressing less numbness in the upper arm and the fingers, and just the last three days my energy had picked up in the mornings. These mats are beautiful, the material is practical, nice to the eye, durable and somehow very soft. My dog loved this, and my mother reported feeling better sleep with just this under her sheet. I use one at my work desk and I wouldn’t be without it. 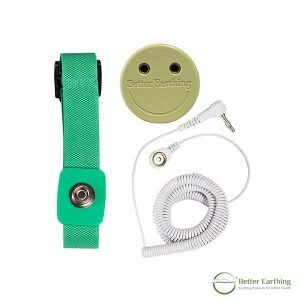 I recently done a interstate trip and packed my Better Earthing Pad ,it gave me the opportunity to use for the first time. My Hotel room was on the 9th floor and I did not use the power plug electrical outlet too Ground the Better Earthing Pad with provided Better Earthing Coiled Lead. I chose a novel approach and attached the lead to the steel pipe at the bottom of toilet Bowl via a rubber band. and attached the other end of the coiled lead to the Better Earthing Pad, as I was concerned about Dirty Electricity in the Hotel I was staying at. This method I was able to negate the potential problem of Dirty Electricity. My Mat was perfectly grounded via testing from Better Earthing Multimeter. 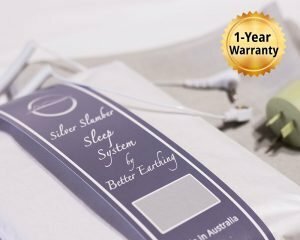 I was able too experience a very rejuvenating sleep using the Better Earthing Pad on my entire trip. I have several products from this Company and I am very impressed with the quality and durability. There has also been a huge reduction in heart palpitations. It is rare for me to have one these days since earthing. I have no doubt that our bodies are benefiting from earthing in more ways than we can see or feel. Inflammation has far reaching consequences and by reducing it we can’t help but be healthier. Personally, I can only see positive signs from earthing and am glad I started. Thank you Peter for your high quality products, wonderful customer service and for your patience in answering all my questions before and after my purchase. This is a great product. The material is sturdy and easy to keep clean. Great for using on the sofa. 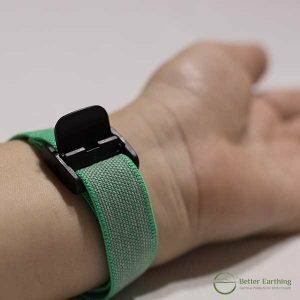 I received a free earthing wrist band (with my large order) which was a nice bonus.